Mulligans, Move Ups and Split the Pot tickets will be sold during check-in the morning of the event. Cash only. FORMAT: 18-hole four-person scramble tournament. Note: Teams composed of three players will get to take a fourth shot. Be sure to rotate your players when taking the fourth shot. RULES: A scramble format means that all four team members tee off on each hole and then decide which tee shot they like the best and mark the spot with a tee or ball marker. If the ball you choose to play is in a hazard (sand, water, etc. ), or the rough, you cannot drop the ball outside of the hazard or rough even if relief is within one club length away. Max 2-Putt – Which means if the first putt is missed from the putting surface (shortest grass) then the next putt is considered “good” and will count as 1 stroke. Max Bogey -To keep the pace of play moving, maximum score on any hole is a bogey. Men will always tee off from the white tees, and women will always tee off from the green tees, unless you purchased a “move up” for holes 5 or 18. 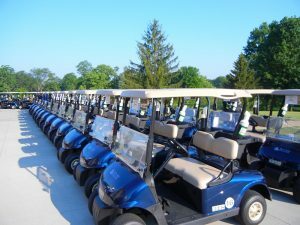 “Move Ups” – If purchased, men can move up to the next tee box and women can move up to the edge of the fairway on holes 5 and/or 18. Max 1 per person or 4 per team. Mulligans – If purchased can be used as a do-over. If you don’t like your shot or putt, take a mulligan. Max 2 per person or 8 per team. Closest to the Pin: Holes 4 & 13 If your tee shot is closest to the hole, write your name on the marker card and place the marker in the ground on the spot where your ball came to rest. Once the marker has been placed in the ground, it should stay there until someone else hits a closer shot. Longest Putt Made: Hole 18 If your putt is the longest made, write your name on the marker card and place the marker in the ground on the spot where you putted the ball. Once the marker has been placed in the ground, it should stay there until someone else makes a longer putt. Longest Drive: Hole 8 If your drive is the longest, write your name on the marker card and place the marker in the ground on the spot where your ball came to rest. The ball must be in the cut fairway to count. Once the marker has been placed in the ground, it should stay there until someone else hits a longer drive. Kleingers Call Your Shot: Hole 8Kleingers will provide a surveying crew on this hole. 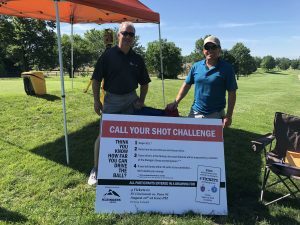 For a $10 charitable donation, you will be able to “Call Your Shot” before you tee off. You will state the distance that you think your drive will be. Only those that land in the fairway will be measured. If your drive is within plus or minus 10 yards of the distance you will double your money and be paid in cash. Otherwise your $10 donation will go towards the Josh Gentry Memorial Scholarship fund.